Jugalbandi is an Indian musical form invented by Ali Akbar Khan and Ravi Shankar, in which two melody instruments play together accompanied by tabla drums.This format enables three artists to combine their decades of dedicated study to this profoundly spiritual music to create an unforgettable musical experience. Peter van Gelder – (Sitar) first appeared on the San Francisco music scene playing bass guitar and soprano sax in the seminal Great Society rock band with Grace Slick. He was one of the first American disciples of India’s great Maestro Ali Akbar Khan, and one of the very few people to have studied with the great Annapurna Devi, sister of Ali Akbar Khan and wife of Ravi Shankar. He has performed with world famous musicians including Zakir Hussain, Chitresh Das, and Lalgudi Krishnan. His lucid sitar style has won praise from audiences around the world, from Europe to the Fiji Islands as well as India and China. 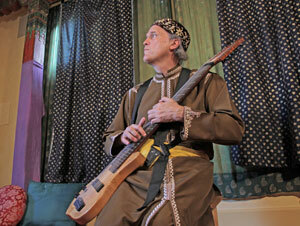 Watch a video of Teed Rockwell and Peter Van Gelder, with Michael Lewis, Tabla. 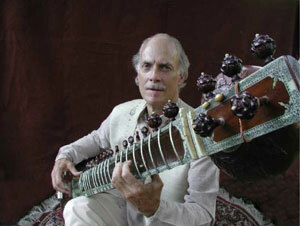 Teed Rockwell is the only person in the world to play Indian music on the touchstyle veena- a guitar-like instrument which is played by tapping the strings with the fingertips, making it possible to play a separate part with each hand. He took over a hundred classes with Ali Akbar Khan, and also studied extensively with sitarist Shahid Parvez. His group Australian Bebop Ragas, which combines Indian ragas and rhythms with the playing of didgeridu master Stephen Kent, has received extensive air play and has performed in concerts throughout the United States. He frequently performs in the festival of harps concert series with harpist Diana Stork, and is featured on the Polygram album Harpestry, which has sold over 200,000 copies. Teed’s CD Hindustanti Ragas is available on CD baby.